This Benefit Report for Year 2018 for knowwhereyourfoodcomesfrom.com, Inc. has been prepared by Frank W. Barrie, the benefit corporation’s President. Pursuant to the benefit corporation’s bylaws, at the annual meeting held on February 1, 2018, the shareholders elected three directors of the benefit corporation: Frank W. Barrie, Albany, NY; Edward Stevens, Loudonville, NY; and Kathryn Sikule, Albany, NY. At the Annual Meeting of the Board of Directors on February 1, 2018, Frank W. Barrie was elected President of the Board and Edward Stevens was elected Secretary of the Board. The website has also published 53 posts in 2018 (approximately once a week). This content appearing on the website www.knowwhereyourfoodcomesfrom.com is relevant to the good food movement’s goal to meet the standards of the six principles of the Food Alliance certification program delineated above. There were 29 Food News posts in 2018: Chile’s war on its obesity epidemic rooted in controlling marketing of processed foods (1/9/18); Health benefits of hot tea (1/26/18); To get college students to eat veggies requires marketing pizazz (2/18/18); Changing political situation in Chile puts marketing controls of processed foods at risk (2/20/18), Maple sugaring season underway (3/15/18); Citizen lawsuit against industrial chicken processing facility producing 2.4 million gallons of daily waste moving forward (3/30/18); Pineapples growing in Providence, Rhode Island (4/5/18); Bananas superior to sports drinks in aiding athletes’ recovery from intense workouts (4/12/18); Environmental Working Group’s Dirty Dozen of fruits & veggies with pesticide residues ranked for 2018 (4/19/18); Impressive farm to table dining at certain hotel restaurants (4/26/18); Canning of Maryland tomatoes for retail sale brought back by praiseworthy Woodberry Kitchen, a farm to table restaurant (5/10/18); Heritage farm in NYC’s Staten Island growing 45 tons of produce (5/23/18); Vermont ranked #1 Green State in U.S. reaching out for new residents (6/1/18); Arkansas improves its Locavore Index as a result of Heifer International’s developing a CSA program state-wide (6/8/18); Peach farmer David Mas Masumoto receives organic pioneer award from Rodale Institute (6/13/18); Fast Food Frankenstein concoctions (6/27/18); Teff, the world’s tiniest grain, grows in popularity (7/3/18); Nature’s Path, winner of Rodale’s 2018 organic pioneer award, resigns in protest from the Organic Trade Association (7/10/18); Live webcast available at no cost of sold out Farm Aid 2018 concert to be held in Hartford, CT on Sept. 22nd (8/7/18); Rural public library system shares locally grown fresh veggies and fruits (8/23/18); Sierra Club’s 12th annual cool schools ranking spotlighting top ten for food (9/20/18); Farmland preservation organization raises funds from successful art show of landscapes for sale by 60 artists (9/26/18); Food Tank’s Summit in NYC on avoiding food waste (10/5/18); Best children’s books on gardening (10/11/18); Community Orcharding network helps consumers find organic apples (10/18/18); Farmstead Creamery’s pastoral operation closed down and replaced by a more industrial-scale one (11/2/18); Study of 70,000 adults suggests organic food diet reduces risk of lymphomas and breast cancer (11/10/18); Carrot Project grows the local farm economy in New England and Hudson River Valley (11/27/18); Center for Science in the Public Interest challenges marketing campaigns by Coca Cola and Jamba Juice in the courts (12/8/18). And there were 16 posts in the nature of Reviews. Nine book reviews: The Hidden Half of Nature, The Microbial Roots of Life and Health by David Montgomery and Anne Bikle (3/7/18); The New Bread Basket, How the New Crop of Grain Growers, Plant Breeders, Millers, Malsters, Bakers, Brewers and Local Food Activists Are Redefining the Daily Loaf by Amy Halloran (3/12/18); Fermentation On Wheels Road Stories, Food Ramblings and Do-It Yourself Recipes by Tara Whitsitt (3/23/18); Homegrown Whole Grains, Grow, Harvest and Cook Wheat, Barley, Oats, Rice, Corn and More by Sara Pitzer (5/2/18); Growing A Revolution, Bringing Our Soil Back to Life by David R. Montgomery (5/29/18); The Farmette Cookbook, Recipes and Adventures From My Life On an Irish Farm by Imen McDonnell (8/14/18); Why You Eat What You Eat by Rachel Herz (9/13/18); A Precautionary Tale, How One Small Town Banned Pesticides, Preserved Its Food Heritage and Inspired a Movement by Philip Ackerman-Leist (12/3/18); and Soframiz: Vibrant Middle Eastern Recipes from Sofra Bakery and Café by Ana Sortun and Maura Kilpatrick (12/20/18). Five restaurant reviews: True Food in Nyack (Rockland County), NY (1/19/18); Field Notes at Lansing Farm in Colonie (Albany County), NY (7/16/18); Seeds Market Cafe at Hancock Shaker Village in Pittsfield (Berkshire County), MA (8/3/18); de la terre Bakery & Café in Vineland (Ontario), Canada (9/5/18); and Sofra Bakery & Café in Cambridge (Middlesex County) MA (11/19/18). One film review: Look and See, A Portrait of Wendell Berry (2/1/18). And one review of an art exhibit: Art and the New England Farm at the Florence Griswold Museum in Old Lyme (New London County), CT (6/19/18). Eight recipes using local and organic ingredients were also posted: Spinach and smoked chicken gratin (1/3/18); Organic Montmorency cherry cobbler for Valentine’s Day (2/13/18); Common Good Soup Kitchen’s popovers (5/17/18); Blueberry rhubarb cobbler (7/23/18); Eggplant stew (8/29/18); Apple crumble (10/26/18); Homemade Herbes de Provence (12/14/18); Apple cakelets (12/24/18). 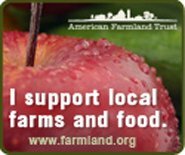 Small ads/logos appearing on the website during 2016 have promoted the following organizations/entities (at no cost to these organizations/entities): (1) Native Seeds, www.nativeseeds.org, (2) Equal Exchange, www.equalexchange.coop, (3) American Farmland Trust, www.farmland.org, and (4) Chefs’ Consortium, www.chefsconsortium.com. These four organizations/entities reflect principles in harmony with the six principles of the Food Alliance certification program delineated above. In 2018, the website also ran the ads/logos for three businesses: Liberty Tabletop, Fruition Seeds and My Pet Chicken. Liberty Tabletop is now the only manufacturer of flatware in the United States, and its concern for the American consumer’s health and safety is reflected in its commitment to only use stainless steel from American steel mills that follow stringent environmental and safety standards, to meet or exceed all federal and state environmental regulations and standards, and to never use harsh or carcinogenic chemicals in its manufacturing process. In the period January 1 through December 31, 2018, traffic to the website, www.knowwhereyourfoodcomesfrom.com remained steady, saw a substantial increase in the number of page views to 110,288 from the prior year’s 73,017 page views. The number of users and sessions during 2018 remained steady with 40,732 and 47,379, respectively in 2018, compared to 42,476 and 49,128 in 2017. During 2018, the benefit corporation has maintained an active Facebook page [https://www.facebook.com/knowwhereyourfoodcomesfrom/]. As of the close of the year, the Facebook page has nearly 400 followers, with Facebook posts appearing approximately every week. Although users of the website are located world-wide, 87% were located in the United States and the five states with the most users in calendar year 2018 are New York, Massachusetts, New Jersey, California, and Michigan. Approximately 4% of users were located in Canada.